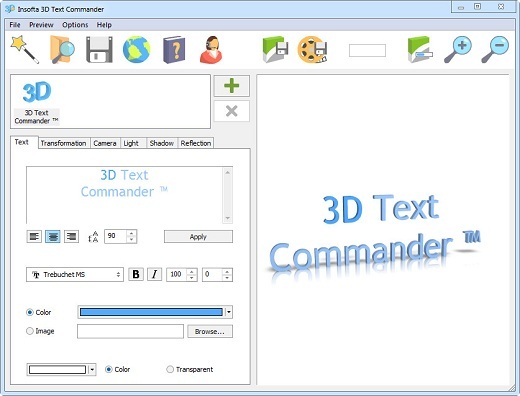 P2P group has released an updated version of “Insofta 3D Text Commander”. Capture your reader’s attention with an animated 3D banner. Take advantage of the complimentary texture library. Shape up your text to meet your taste: enter text of any size in one, two or more lines, and center or align it by the left or the right margin, choose the font, size and style. Enjoy simplicity and confidence: all operations are performed within one screen, and the wizard with pre-made templates and stuffed textures library will not let you slip off the way and get lost in the depths of the application. Preview your final 3D text in the real-time preview window; turn it any way around by just dragging it with the mouse. Decorate your 3D text with realistic 3D shadow and reflection – by moving the light and playing with its intensity. Take your final high-resolution anti-aliased 3D-text banner of up to 4000 by 4000 pixels straight to the publisher; skip a countless number of conversion operations, and save it to the format you need directly. 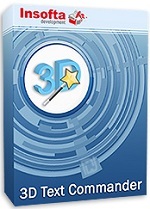 Feel free to post your Insofta 3D Text Commander 5.1.0 Multilingual-P2P + Portable torrent, subtitles, samples, free download, quality, NFO, rapidshare, depositfiles, uploaded.net, rapidgator, filefactory, netload, crack, serial, keygen, requirements or whatever-related comments here. Don't be rude (permban), use only English, don't go offtopic and read FAQ before asking a question. Owners of this website aren't responsible for content of comments.